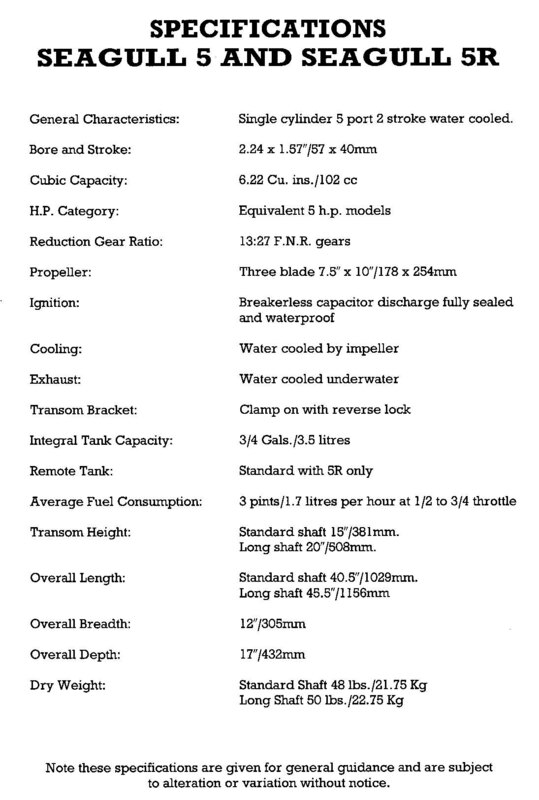 A page on one of the last British Seagulls, the 5 R.
The 5R was one of the very last motors that ‘Chillington’ developed in 1992 & 93.It had a slightly thicker crankshaft (17mm), with three deep ball bearings, one at the bottom and two at the top.A roller big end was also fitted.The sealing of the crank was made with two 17mm x 35mm oilseals. The block was a modified QB and the top part of the crankcase was altered to take the roller bearings and seal.The bottom half had only the tiller arm stub removed and a drilled hole for the fuel pump.A modified Wipac Mk IV ign was fitted. The block had the exhaust flange removed, and the unit sat on a Yamaha leg with 360 degree pivot and normally a FNR gearbox. There was an adapter plate made from a machined block of aluminum, fitted with a Yamaha twist grip tiller arm. The adapter plate had the engine number stamped into it; see below. The leg allowed pivot reverse, but there was a model with FNR gears. Engine Numbers were apparently prefixed ‘SK’. The ‘L’ was used for long shaft versions, and ‘R’ was added to all those with roller bearings.From this I deduce that some were plain bearing, probably Kingfisher cranks (With or without roller big end? ).The ‘R’ in the model ID related to the ‘Remote Tank’ option, which was fitted to all soon after production started. I have only come across one of these units intact.I can’t find out how many they made, but there were not many.The failure of the crankshaft and its bearings, from the evidence of the scrap ones I have seen, could be the reason. The 5R is sought after by those who race seagulls, as the most ‘tweakable’ seagull. Have a look at the ‘propspring’ or ‘New Zealand’ web sites on thelinks page. Some parts are available. I am indebted to Charles Large for filling in some of the gaps in the technical details. This article by Charles was added to the Forum in 2008, following a 5R being offered on that auction site... it was felt it might be an idea to print it again here, good idea too, so here it is! Now I feel I should give a little history on this motor series. 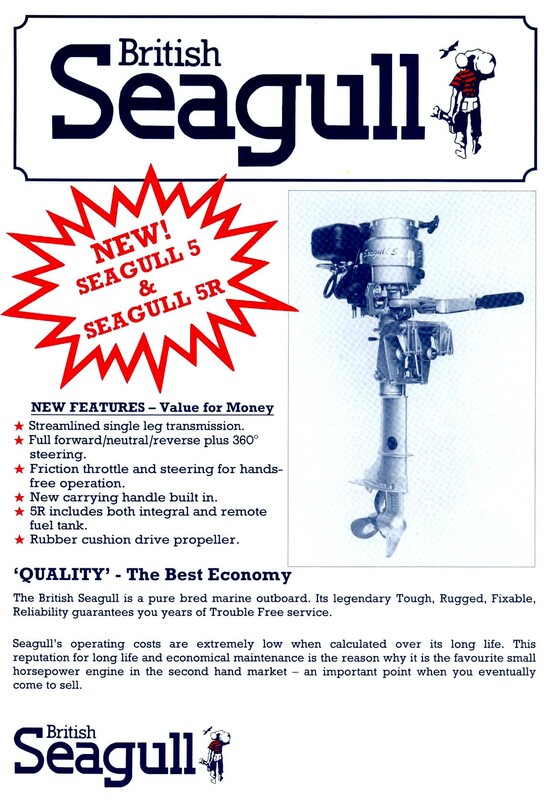 In the early 90’s British Seagull were in competition with mainly Japanese manufactures who were turning out 5hp outboards, that were running on a 50 or a 100 : 1 oil mix, at this time the best British Seagull could run on was 25 : 1 in the QB series, after fitting the needle roller crankshaft in the Kingfisher they upped the fuel ratio to 50 : 1 to try & keep up. Only to discover that many of these motors were not lasting the first year before suffering lube problems on the main bearings, often requiring a new crankcase, a very expensive warranty claim for what was now a small English manufacturer. So they decided to follow the Japanese example, & move to a fully bearing crankshaft this coincided with the FNR gear box availability problem, so they looked at buying complete legs first from Selva & then from Yamaha, the decision was taken to follow the Yamaha route & a leg from the 4B single cylinder 4hp outboard was chosen, probably on the grounds of cost, as the Selva would appear more useful for British Seagull traditional user base, with it’s lower gear ratio, larger prop & it’s through the prop exhaust, giving a quieter engine more suitable to the larger hull. To attach the Yamaha leg to the Kingfisher power head an adapter plate was designed, a complicated heavy aluminium casting that solved the problem of delivering the exhaust gases to where the leg needed them & the cooling water to the cylinder & the coolant return to cool the exhaust tract in the leg, only to discover that the British Seagull tiller arm fouled the adapter plate, so provision for the Yamaha tiller arm/throttle was made in the adapter plate. To permit the Kingfisher cylinder fit, without it being too high, it was found necessary to remove the exhaust stub from the base of the cylinder. Up to this point Kingfisher crankshafts had always run in phosphor bronze bearings reamed to 0.625” ID but the crankshaft was ground to 0.6235” to give sufficient oil clearance. Ball races with this ID, were & are not available & would have had to be custom made, a very expensive answer to this problem, so the crankshaft was redesigned with 17mm main bearing journals to suit a standard 6003 deep groove ball race, it was then found that while the lower crankcase half, had sufficient meat to permit the boring of a 35mm hole for the bearings, the top half would not, so a new meatier casting was designed to cover this. This all fitted together real nice but there was no provision for fitting a fuel pump & the Yamaha tiller arm fouled the British Seagull tiller arm stub, this was just cut off, & the fuel problem answered by fitting a plastic tank. At this time the largest prop available from Yamaha for this lower unit was a 7 ½” by 8” pitch which on a small hull allowed the power head to rev at over 6000 revs, a bit too much for a motor that was designed to run 5000, so to prevent this British Seagull had the props pitched up locally, to circa 10”. At some point a vacuum operated fuel pump was cobbled onto the crankcase to permit the use of an external fuel tank, creating the 5R, a British Seagull 5 with a remote fuel tank. This also needed a carb with a slightly smaller fuel gallery to prevent flooding, as fitted to the pumped version of the Kingfisher. Now the problems with 15 year old Seagulls 5 & 5Rs. First the crankshaft, to utilise a steel conrod with needle roller big end bearings it was necessary to use a 3 piece crankshaft with a removable big end pin made from a better grade of steel than the rest of the crank to cope with the loads from the needle rollers, these bearing wear & as any scooter owner knows it a simple job for your local scooter shop, they just separate the crank halves & replace the conrod bearings & big end pin. Not so with the British Seagull 5, due to the design of the crankshaft with very little support around the pin the hole tends to get slightly larger each time a pin is pressed in place, & as con rods & pins have not been available for about 10 years, when your big end gets tired all you can change is the caged needle rollers, which means your using a worn pin & conrod, so this set of needles won’t last too long. The next problem is that the interference fit of the pin in the crank web holes is not as tight as it should be often permitting movement during use, causing tight spots & very rapid main bearing failure, hence the spots of weld often found on these pins,& the next time the pin has to come out, the weld usually damages the hole even more. A proper repair on these crankshafts requires a new custom made pin made slightly larger where it goes into the crank webs to give the correct interference fit, a new steel conrod & new needle rollers to suit. The only way I found to get con rods was to order 25 to be made for me & Ross Leger in New Zealand, an expensive serious undertaking. The next problem with these cranks is it’s location, it’s in close proximity to the returning, leg cooling water. Where the lower half of the crankshaft connects to the Yamaha drive shaft there is an oil seal to prevent crankcase compression loss, below this the end of the lower main bearing journal runs dry, that is until it come in contact with water, often salty, causing surprise, surprise, rust adjacent to the oil seal, which tends to start to fail soon after, a which point when you’ve used your motor & it’s cooling down, water tends to be sucked onto the lower main bearing causing corrosion on the balls, now as it has some corrosion on it, it will start to run much rougher & hotter, on these crankshafts they seem to run hot enough that the portion next to the crankshaft expands to permit the crank to spin in the now tight main bearing, wrecking the crank journal. Most British Seagull 5’s died down this route. When the bearings got this hot the outer diameter often stretched the crankcase enough that the next set of bearings would rotate in the crankcase necessitating a new crankcase. If you leave a 5 standing for more than 6 months without a full bearing change before use or at least a full strip down inspection, your going to have a very expensive problem. British Seagull themselves drilled & tapped 3 holes in the steel centre of the flywheel on the later 5,s so that the flywheel could be removed with a special puller tool to prevent the hammer removal method stressing the big end pin retaining holes & causing the early demise of your engine. The next problem that seems to plague the 5 series outboards is corrosion. The Yamaha leg that seem to last very well when used by them, but did not seem to like, the very mixed metal environment of the British Seagull & suffers very badly so much so that the three 5’s I’m restoring. have all needed new legs, perhaps British Seagull should have used sacrificial anodes. The adapter plate seems to love dissolving in water, I think it must be made of a very cheap casting alloy, so much so that often the water feed to the cylinder runs into the exhaust & seems to be almost impossible to weld up, even when the white powder has been sand blasted away. So new adapter plates & all the machining that needs. The water cooled Kingfisher head that was used on this series seems to have a life expectancy of 5 to 8 years before needing renewal, while the cylinders last much better, expect to have to have the top face where the head sits, resurfaced, when your cleaning out the water jacket & renewing the head. So if your bidding on this motor with a view to using it,DO NOT START IT UNTIL IT’S HAD A COMPLETE STRIP DOWN,you can total the crank in 10 seconds!Nothing else will fit. And if your adapter plate is in a useable condition be prepared to buy yourself a good phosphor bronze Kingfisher for £350 to £450, spend £50 on the machining & build yourself a British Seagull 5 that you can use year in year out. Don’t worry I won’t be bidding, I can only see £50 to £75 worth of bits.